After a few years of doing her thing in the standard rock band setup, No Joy’s Jasamine White-Gluz is branching out into other forms of music-making for her latest release, a collaboration with Sonic Boom aka Pete Kember. The resulting EP, unsurprisingly entitled No Joy/Sonic Boom, takes things in a more electronic, spacey direction, as anyone who’s heard Kember’s previous output as Sonic Boom would expect. 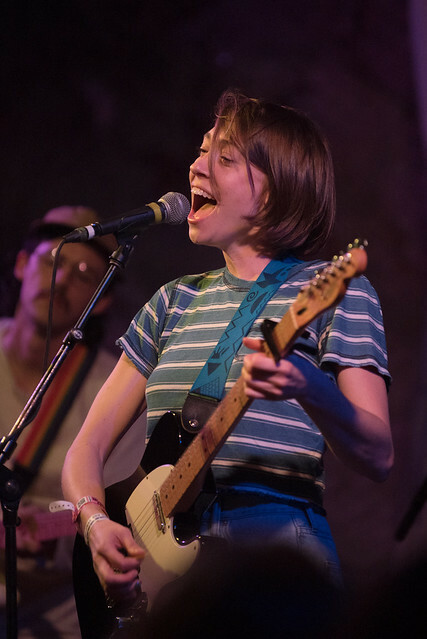 During the Panic Manual’s recent trip to Austin for SXSW, Detroit’s Anna Burch was high on my list of acts to catch and she certainly did not disappoint. The Easter weekend is upon us, which got me to thinking – what are the great Easter songs? Unlike Christmas, there aren’t really that many noteworthy Easter songs (with Irving Berlin’s “Easter Parade” being an obvious exception). So in lieu of an actual Easter tune, we give you “Tilted,” one of the tracks off of Sugar’s 1993 EP Beaster, which was released right around Easter 25 years ago. And even though 25 years have passed, it still sounds as vital as ever.